I would have never thought that I would become a civil rights activist. I’ve been in the military my entire adult life and grew up in it as a child. I was raised with the concepts of loyalty, obedience, and honor as being central to my life. Likewise I have been a Christian pretty much all of my life, and a minister, priest, and chaplain for a quarter of a century. Typically when you mix military, Christian, and clergy the combination does not lead to one becoming a civil rights activist. But the long strange trip that has been my life to dates has thrust me into places that people like me seldom experience, much less live. When I was in high school I was part of a school district that desegregated. There was a lot of opposition to it in the community, but my class at Edison High School, Stockton California, was as racially diverse as anyone could imagine and unlike many other places where the experiment went wrong, our class came together and made it work. Many of us have stayed in contact throughout the decades and our reunions are always well attended, we were, and still are, Soul Vikes. When left active duty to go to seminary and went into the National Guard, came to know what it is to be poor, to wonder where the next meal, rent payment, tank of gas, or money for prescription medicine might come from. I know what it is like to have a home foreclosed on, to have a car repossessed, to have bill collectors harass one day and night. To work full time with a college degree and not make a living wage because “good Christians” didn’t think seminary students deserved a living wage because they were not going to stay around after they were done with seminary. I know what it is to have lived in a crime and drug infested area in a rented house that did not have heat during the winter. I know what it is like to lose a job when mobilized to serve overseas, and have those that did it blacklist me among my profession when I complained to the Department of Labor when I returned home. Likewise, my profession as a military officer, first as a Medical Service Corps officer, and later as a Chaplain in the military and as a civilian hospital chaplain brought me into contact with people and experiences that I would not have had otherwise. I was assigned to help write the Army’s personnel policy for people with HIV and AIDS in 1987 and because I was the junior personnel officer I because the point of contact for every officer diagnosed with that dread disease. The experience made me realize that the people who got it, regardless of whether they were gay or straight were real human beings faced what was then a certain death sentence. So I started speaking up for them. When I was in seminary I worked for a social service organization working in the slums and barrios of San Antonio before moving to Fort Worth and for a time working as the administrative coordinator for a homeless shelter. When I finished seminary I ended up doing my hospital chaplain (Clinical Pastoral Education) residency at Parkland Memorial Hospital in Dallas. While most of my time was spent in the trauma-surgery department and the emergency rooms, I still dealt with many AIDS patients, some whose families rejected them, and if they were Gay, were also condemned by their families, pastors, and churches. While at Parkland I dealt with death every day, much of it violent, and I saw the vast disparity between those who had insurance and those who had to rely on charity or some kind of minimal government provided heath care program. When I came back from Iraq suffering from full-blown PTSD I came to understand what it was like to suffer depression, hopelessness, struggle with faith, and contemplate suicide. I also came to know what it was like to be ostracized and then kicked out of my church, and be sidelined by other Navy chaplains. As I struggled during the early stages of returning home and dealing with the craziness of PTSD my first therapist asked what I was going to do with my experience. I told him that regardless of the cost I would be honest and speak out. I started doing that with PTSD but soon as I was struck by how unjust I felt that I had been treated, and seeing others being treated the same way because of prejudice, whether it dealt with mental health, race, sexuality, religion, social or economic status, I began to speak up for them as well. 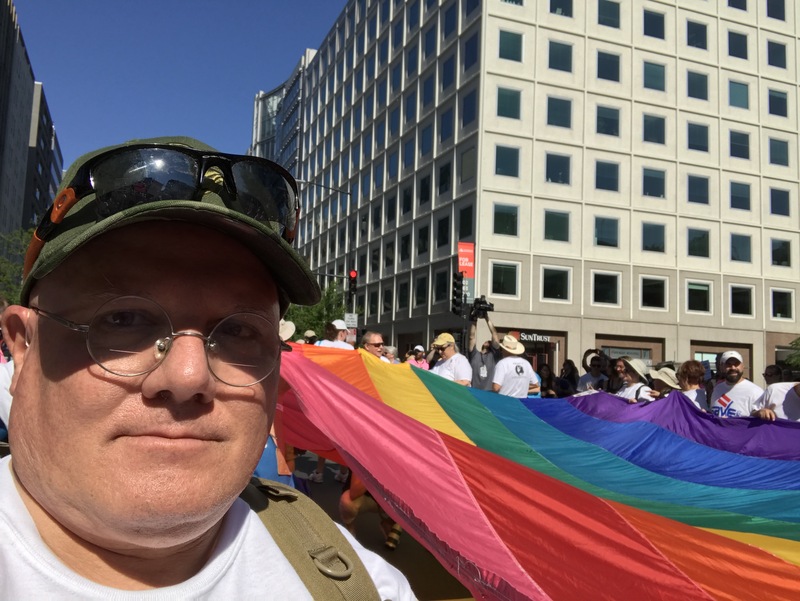 Speaking up for the LGBTQ community, women, and Muslims, got me thrown out of the church I had served for 14 years as a Priest, but that only hardened my resolve to fight for others, even in my own neighborhood. That has continued now for almost a decade since I returned from Iraq. All of the experiences I had before then came more sharply into focus, and if you read this site regularly or scroll through my vault of over eight years of articles you will see how over the years I have continued to become more of an advocate for civil rights. But I think that this is something that my faith as a Christian and oath as an officer to the Constitution demands I do. The German pastor and martyr to the Nazis Dietrich Bonhoeffer wrote: “We are not to simply bandage the wounds of victims beneath the wheels of injustice, we are to drive a spoke into the wheel itself. That means that I have to fight the battle. So anyway, here I am an accidental activist. God bless you padre Steve,keep doing what you’re doing!! I read your site weekly but have never comment. There is always hope & goodness even in the darkest of times. Thank you for your service. I just discovered your blog today, and have bookmarked. Great to find conscientious observation with a sense of history. The sect which disinvited you is obviously due for reformation. I wish for you peace and stamina. You seem to be fighting for what’s worth fighting for.